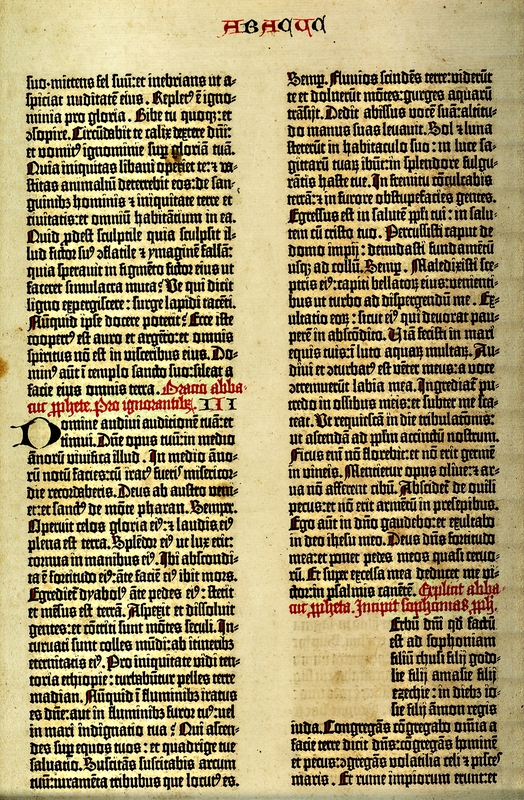 Mainz : [Printer of the 42-line Bible], 1455. Two lines supplied in blue, headlines in blue and red. Two- and six-line blanks left for initials. This leaf was purchased along with : A noble fragment of the Gutenberg Bible, with a bibliographical essay by A. Edward Newton. New York: William Edwin Rudge for Gabriel Wells, 1921, p., bound in blue leather. There is apparently no definite evidence of who cut or cast the type, so in truth the association of the book with Gutenberg is no more than a plausible conjecture. See the Wikipedia article on the Gutenberg 42-line bible for much more information.